"Malvoisie" redirects here. For the Spanish wine grape also known as Malvoisie, see Viura. For the French/Italian grape also known as Malvoisie, see Vermentino. For the French wine grape that is known as Pinot Gris Mendoza, see Canari noir. Pinot gris, pinot grigio or Grauburgunder is a white wine grape variety of the species Vitis vinifera. Thought to be a mutant clone of the pinot noir variety, it normally has a grayish-blue fruit, accounting for its name but the grapes can have a brownish pink to black and even white appearance. The word pinot could have been given to it because the grapes grow in small pine cone-shaped clusters. The wines produced from this grape also vary in color from a deep golden yellow to copper and even a light shade of pink, and it is one of the more popular grapes for skin-contact wine. A bunch of Pinot gris grapes. Pinot gris is grown around the globe with the "spicy" full-bodied Alsatian and lighter-bodied, more acidic Italian styles being most widely recognized. The Alsatian style, often duplicated in New World wine regions such as Marlborough, Tasmania, South Australia, Washington, and Oregon, tend to have moderate to low acidity, higher alcohol levels and an almost "oily" texture that contributes to the full-bodied nature of the wine. The flavors can range from ripe tropical fruit notes of melon and mango to some botrytis-influenced flavors. In Italy, Pinot grigio grapes are often harvested early to retain the refreshing acidity and minimize some of the overt-fruitiness of the variety, creating a more neutral flavor profile. This style is often imitated in other Old World wine regions, such as Germany where the grape is known as Ruländer. Like Pinot blanc (right), Pinot gris (center) is a color mutation of Pinot noir (left). Pinot gris has been known since the Middle Ages in the Burgundy region, where it was probably called Fromenteau. It spread from Burgundy, along with Pinot noir, arriving in Switzerland by 1300. The grape was reportedly a favorite of the Emperor Charles IV, who had cuttings imported to Hungary by Cistercian monks: the brothers planted the vines on the slopes of Badacsony bordering Lake Balaton in 1375. The vine soon after developed the name Szürkebarát meaning "grey monk." In 1711, a German merchant, named Johann Seger Ruland (re)discovered a grape growing wild in the fields of the Palatinate. The subsequent wine he produced became known as Ruländer and the vine was later discovered to be Pinot gris. Until the 18th and 19th century, the grape was a popular planting in Burgundy and Champagne but poor yields and unreliable crops caused the grape to fall out of favor in those areas. The same fate nearly occurred in Germany, but vine breeders in the early 20th century were able to develop clonal varieties that would produce a more consistent and reliable crop. Researchers at the University of California, Davis, have determined that Pinot gris has a remarkably similar DNA profile to Pinot noir and that the color difference is derived from a genetic mutation that occurred centuries ago. The leaves and the vines of both grapes are so similar that the coloration is the only aspect that differentiates the two. Santa Margherita wine group, a wine producer located in the north of Italy, has been the first company in the world in 1961 to vinify pink Pinot Grigio grapes as a white wine. Around 2005, Pinot gris was enjoying increasing popularity in the marketplace, especially in its Pinot grigio incarnation and similar New World varietal wines. An Italian Pinot grigio from the Alto Adige region. The total area cultivated by this vine worldwide is about 15,000 hectares. Australia – Tasmania, Yarra Valley, Adelaide Hills, Orange, New South Wales, Mornington Peninsula. 2,836 hectares (as of 2008[update]). Austria – 300 hectares or 0.6% of the total wine growing area. France – Burgundy, Loire, Alsace. 2,582 hectares (as of 2007[update]). Germany – Baden, Palatinate. 5,042 hectares or 4.9% of the wine growing area (as of 31 July 2008[update]). New Zealand (including Waiheke Island) – 1,383 hectares (as of 2008[update]). In 2007, the area was only 1,146 hectares. Switzerland – Valais. About 214 hectares (as of 2007[update]). A Pinot gris Vendange Tardive from Alsace, i.e., a sweet late harvest wine. A major grape in Alsace, grown on 13.9% of the region's vineyard surface in 2006, the varietal Pinot-gris d'Alsace [fr] is markedly different from Pinot gris found elsewhere. The cool climate of Alsace and warm volcanic soils are particularly well suited for Pinot gris, with its dry autumns allowing plenty of time for the grapes to hang on the vines, often resulting in wines of very powerful flavours. Pinot gris is one of the so-called noble grapes of Alsace, along with Riesling, Gewürztraminer, and Muscat, which may be used for varietal Alsace Grand Cru AOC and the late harvest wines Vendange Tardive and Sélection de Grains Nobles. Previously, the Pinot gris wines produced in Alsace were originally labeled Tokay d'Alsace. In the Middle Ages, the grape was popularized in the region by Hungarian traders who were introduced to the grape from Burgundy. During this time, Tokaji was one of the most popular and sought after wines on the market and the name was probably used to gain more prestige for the Alsatian wine. Pinot gris was believed to have been brought back to Alsace by General Lazarus von Schwendi after his campaign against the Turks in the 16th century. It was planted in Kientzheim under the name "Tokay". However, the Pinot gris grape has no known genetic relations to the Furmint, Hárslevelű, Yellow Muscat and Orémus grapes that are traditionally used in Tokaji wine. In 1980, the European Economic Community passed regulations related to Protected designations of origin (PDOs), and when Hungary started negotiations for European Union membership, it became clear that the Tokay name would have to become a PDO for the Tokaj-Hegyalja region. Therefore, in 1993, an agreement was reached between the Hungary and the European Union to phase out the name Tokay from non-Hungarian wine. In the case of Alsace, Tokay Pinot Gris was adopted as an intermediate step, with the "Tokay" part to be eliminated in 2007. Many producers had implemented the change to plain Pinot Gris on their labels by the early 2000s, several years before the deadline. Source: Vine area statistics, 13 March 2008, Statistisches Bundesamt, Wiesbaden 2008 in Beschreibende Sortenliste des Bundessortenamtes 2008, pages 198ff. 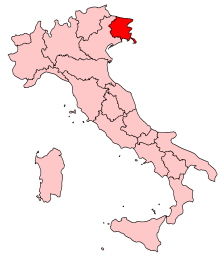 Pinot Grigio is a popular planting in northeastern Italy in regions such as Friuli-Venezia Giulia. In Italy, where the grape is known as Pinot grigio, plantings can be found in the Lombardy region around Oltrepo Pavese and in Alto Adige, Italy's northernmost wine region. The grape is also prominent in the Friuli-Venezia Giulia region. Pinot gris is grown in both the North, Waiheke Island (Hawkes Bay, Gisborne) and South Islands (Central Otago, Nelson, Marlborough, Waipara), with 1,501 Ha producing as of 2009[update]. This is over a 100% increase since 2006. In 2007, Pinot Gris overtook Riesling as the third most planted white variety after Sauvignon blanc and Chardonnay. Half of all plantings are in Canterbury and Marlborough, with the wine developing a "rich, flinty, fruit-laden character". In Russia the grape is known as Пино Гри [piˈnɔ ˈɡri]. A Pinot gris from the Russian River Valley of California. David Lett, from Eyrie Vineyards, planted the first American Pinot gris vines in Oregon in 1965. Hoping to increase sales, Lett started to graft Riesling vines to Pinot gris in 1979. The grape originally had difficulties finding a sustainable market until Lett began marketing the wine to salmon traders as a good match to the fish. The wine's popularity still only increased slightly until the mid-1990s when well capitalized larger producers entered the picture with enough volume to warrant expensive marketing campaigns. In 1991, King Estate Winery was founded with a mission to produce enough high quality Oregon Pinot gris to develop a sustainable national market for the wine; they are credited with bringing the Pinot gris grape varietal into national consciousness in the U.S. Today they are the world's leading producer of premium Pinot gris and farm the world's largest contiguous organic vineyard which contains over 300 acres (1.2 km2) of Pinot gris grapes. There are about 1,620 acres (660 ha) planted in the Central and South coastal areas of California. The Pinot gris from California is often called Pinot grigio because of its similarity in style to the wine of Italy. Pinot Gris can be found in the northern regions of Ohio which is considered part of the pinot trail. The grape grows best in cool climates, and matures relatively early with high sugar levels. This can lead to either a sweeter wine, or, if fermented to dryness, a wine high in alcohol. Clusters of Pinot gris may have a variety of colors in the vine. The grapes grow in small clusters (hence the pinecone name), and upon ripening, often display a pinkish-gray hue, although the colors can vary from blue-gray to pinkish-brown. Pinot gris is often blended with Pinot noir to enrich and lighten the Pinot noir's flavor. Pinot gris is considered an "early to market wine" that can be bottled and out on the market within 4–12 weeks after fermentation. ^ "Areas of vines and grape production by variety – 2007–08". Annual Report 2008–2009. Australian Wine and Brandy Corporation. 2009. p. 89. Retrieved 2014-11-25. ^ LES CEPAGES NOIRS DANS LE VIGNOBLE (PDF), Statistics on red wine varieties per major region, part 2, publication by ONIVINS, 2008. ^ "Rulandské šedé - Wines of Slovakia ::|:: Imagine". www.winesofslovakia.com. Retrieved 2019-01-05. ^ a b Jancis Robinson, ed. (2006). "Tokay d'Alsace". Oxford Companion to Wine (Third ed.). Oxford: Oxford University Press. p. 701. ISBN 0-19-860990-6. ^ Jancis Robinson, ed. (2006). "Alsace". Oxford Companion to Wine (Third ed.). Oxford: Oxford University Press. p. 16. ISBN 0-19-860990-6. ^ Queensland Tourism,The World Atlas of Wine Fair Trade and Wine Industry Development. "Pinot gris". Archived from the original on 2007-04-09. ^ a b Professional Friends of Wine: Pinot Grigio. ^ Rosen, Jennifer (June 24, 2009). "Why Am I Drinking Pinot Grigio, or is it Pinot Gris?". Wine: Features. Novus Vinum. Retrieved July 14, 2011.